I’m going to Norway on Wednesday. I’m flying to Rygge, near Oslo, and then I guess I will just stick out my thumb and see what happens. I’ve made some adjustments in my gear for that trip. I want to hike a bit, especially in the Arctic – I absolutely love high latitude places. In the past when I went hiking, I would always have a place to leave some of my stuff till I get back to civilization. This time I want to carry all my belongings with me, everywhere I go. Which means I really have to minimize everything. No computers, no e-readers, no spare long pants, etc. I also decided to leave my tent – it’s a good hiking tent, but still – too heavy and too big for my needs. Before I got it, I would use my (Canadian Army) heavy-duty poncho to make a shelter but that solution is also far from perfect – the poncho is too heavy, too small when used as a tarp and wouldn’t work well as a rain gear with my backpack. So I got myself a nice piece of tarp. I was surprised that no outdoor store in Poland would carry such an important piece of equipment. Then I thought about hardware department stores and found it there. I’ve also bought trekking poles – setting up a tarp can be a real nuisance if there are no suitable trees around and that’s when the poles come in really handy. And they should make this next trip much easier on my knees. 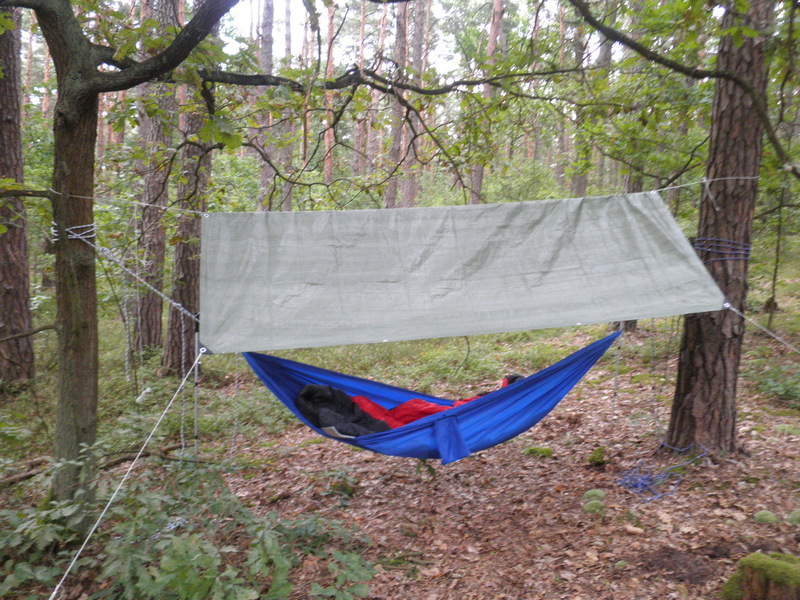 Anyway, I went few days ago to the Kampinos National Park to try out my equipment and some new ideas for camp setup. It all worked pretty well, except for one thing. And this, I feel, is the right moment to introduce you a bit more to the Kampinos Park. If I were to do it with just one sentence, I would use this exerpt from the Park’s website: It’s estimated that even half, which means approx. 16 500, of all animal species encountered in Poland are inhabitating this area (…) including 31 species of mosquitos. And it’s not just some mosquitos, oh no! These were the very first mosquitos to bite through my hiking pants that had remained impenetrable to all kinds of insects I had encountered before. 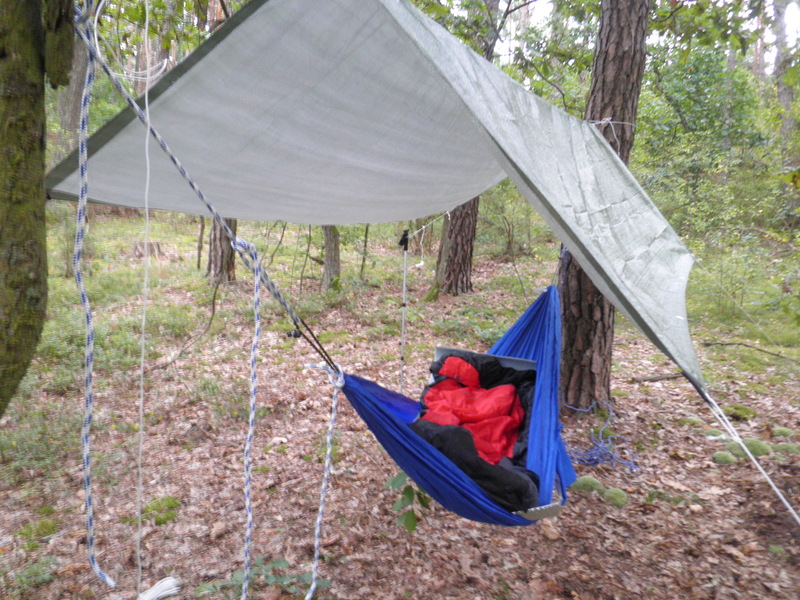 Heck, some of them managed even to get their needle through the hammock, sleeping bag and thick woolen socks combined. As much as I hate to admit it, I feel that this level of skill deserves some credit. So that’s how I discovered that my mosquito-net jacket did not offer enough protection during sleep. And after a sleepless night, I decided to shorten my trip and got back home. And then I scratched. And scratched. And having scratched some more, I bought a big piece of window curtain that will serve me as a mosquito net in my next camp setup. As I’ve mentioned before, I might try some street performing when I’m in Norway. Alas, I’m not taking any web-capable device with me, so this blog will probably turn very quiet till late September or early October and then I will hopefully write about how it went. This entry was posted on Monday, August 5th, 2013 at 12:56 am	and tagged with camping, hammock, hiking, Kampinos and posted in Hiking. You can follow any responses to this entry through the RSS 2.0 feed. So funny seeing the hammock and canopy set up. I have been experimenting with the same thing. Well my last two camps. I don’t think I’ll evet break the tent out again. Nothing like sleeping under the stars. I couldn’t agree more. Too bad you cannot set it up anywhere you like – sometimes suitable trees are nowhere to be found. That’s cute too, how you prove your hunting knowledge by quoting us … sttcsiaits. I can guarantee you most successful hunters can’t quote you those numbers off the top of their heads, but they surely are aware why you don’t want to have a “special” spring season. Common sense v. thinking too hard. Das ganze Geschreibsel hier, blahblahblah und kokolores – nix anderes. Broder artikelte und rief – seine Paladine folgen ihm in ihren Blogs – nix neues! · WIsh I was in the area and could attend! Because a cookie table? Is something I can definitely get behind. And stay behind. Until all the cookies are gone.